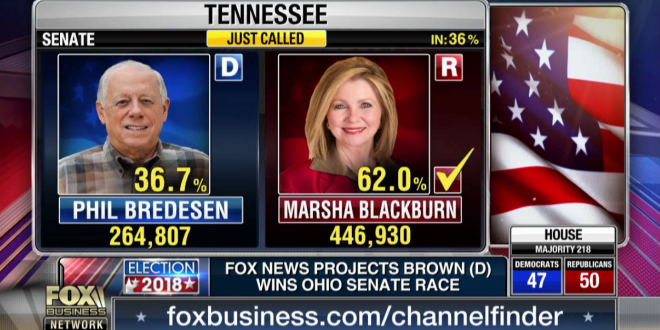 TENNESSEE: GOP Marsha Blackburn Wins Senate Seat - Joe.My.God. The heated race, which some voters described as “vicious,” pitted two household names in the state against each other after Republican Sen. Bob Corker announced his retirement. It was one of the rare Senate races where Democrats had hoped for a pickup as the GOP threatened to expand its majority in the chamber. Blackburn focused her campaign message on supporting President Donald Trump’s agenda in an effort to appeal to the state’s dominant Republican constituency. Nonpartisan political analysis site Larry Sabato’s Crystal Ball had labeled the state as lean Republican and a recent NBC News/Marist poll showed Blackburn with a 4 point lead.